Ed Brubaker and Matt Fraction are tackling some different subject matter than they’ve typically been associated with in Invincible Iron Fist, giving the book a mystical arts / kung fu vibe. 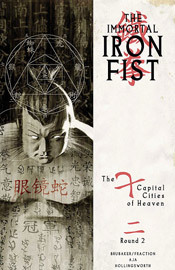 Considering the source material, (the character was created in 1974, during the height of the martial arts action craze) that makes a lot of sense, and actually provides for a very interesting, one-of-a-kind read, at least within the Marvel Universe. While the story does grant a lot of attention to magic and illusion, the kung fu fightin’ is never more than a few pages away, and the mystical elements add a good amount of depth and polish to what would otherwise be a fairly rudimentary action tale. There’s plenty of fists and fury, but they’re grounded by a solid backstory (a tournament to determine the dominant heavenly metropolis) that provides plenty of motivation. While the story does retain a degree of loyalty to the kung fu movies of the mid ‘70s, it also draws inspiration from a more modern source – video games. Unfortunately, this association doesn’t function quite as well on the written page, and actually stands in the way of fluid storytelling on more than one occasion. When Iron Fist’s opponent throws an attack named the “Cudgel of Misfortune” at him, do we really need it to be identified at the top of the panel? It feels very cheeseball, like something they pulled straight out of Mortal Kombat, and doesn’t fit the mood they’ve built to surround it. Asking your readers to accept the reality of a giant tattooed man hurling a lightning-encased whip is one thing. Identifying each of his attacks by name at the top of each panel is another. Scott Koblish and Roy Allan Martinez fill in for regular artist David Aja on a few pages at the beginning and middle of this issue, and their artwork is something of a mess. They work an oddly detail-rich style, often needlessly so, and obliterate their action scenes with a giant wad of unnecessary speed lines. Their backgrounds are detailed when they need to show restraint, then vacant when there’s room for more detail. Their hearts are in the right places, and they bring several very handsome panels to the issue, but they don’t seem to understand the nuances of storytelling. That’s one area in which Aja himself really shines. He has a good feel for how to lead a reader’s eye from one scene to the next, to render a fight scene that flows just as well as a great action movie, and to convey the minute details of conversational body language. When Iron Fist and Fat Cobra meet in the first round of the tournament, their battle is traced beautifully by the two long bands of fabric dangling from the back of Danny’s mask and an echoing pair of bands attached to his beltline. They’re a very subtle part of Iron Fist’s wardrobe, something that’s easy to write off as an extra piece of decoration and ignore, but Aja makes them a crucial piece of the story and they fit the need beautifully. All things considered, this book has the potential to be something really different, not just for Marvel but for the writers and the characters. I love the respect with which they treat most of the subject matter, I like the direction the story seems to be going, I like the artwork and I like the substantial characterization, but this book’s missing something. It’s worth borrowing, at any rate, but keep an eye on it in the future. In the hands of these capable writers, it could turn into a sleeper fairly quickly... but it’s not quite there yet.